Assembly Elections 2017: The BJP, asserted Prime Minister Narendra Modi, is set to win back Himachal Pradesh. The Congress, PM Modi said, "has become a laughing club." Assembly Elections 2017: In Kangra, PM Modi ripped into the Virbhadra Singh-led Congress government. Seven days before Himachal Pradesh votes, Prime Minister Narendra Modi has packed in two rallies in the hill state today before he flies to Gujarat, where elections will be held next month. At his first rally in the key district of Kangra, the Prime Minister said there was an urgent need to "save Himachal from the Congress," which he said now only symbolises "Bhrashtachaar (corruption)", "Pariwaarwaad (family)", "Jaatiwaad (caste politics)." PM Modi also accused the Congress and its top leaders of questioning the BJP government on matters "that any Indian would be proud of." "The entire nation is witness to how the Doklam issue was dealt with, but the Congress even questioned that...Someone born in a family which has ruled for decades doesn't believe his own Army and agencies? Instead, he meets China's envoy and asks about Doklam," the Prime Minister said, a reference to Congress vice president Rahul Gandhi's meeting with Chinese ambassador Luo Zhaohui in July this year, which put his party in a spot; it first denied the meeting took place and then had to confirm it amid taunts from the BJP. The BJP, asserted the Prime Minister, is set to win back Himachal. "I can sense the love you all have for the BJP. In fact, I was telling my colleagues, why do you want to send me...We are winning Himachal anyway. People in Himachal love their local BJP leaders so much that I am not required," said the Prime Minister, whose party has departed from its usual practice and has named a chief ministerial candidate in Prem Kumar Dhumal. PM Modi ripped into Chief Minister Virbhadra Singh of the Congress, projected by the party for the top post again, pointing out that he is out on bail in a corruption case. The Congress, PM Modi said, "has become a laughing club." State after state, he said, has rejected the Congress, suggesting that it was time for Himachal to do the same. "Five monsters - Mining Mafia, Forest Mafia, Drug Mafia, Tender Mafia and Transfer Mafia - have flourished in Himachal under the Congress...time to get rid of them," the PM said. 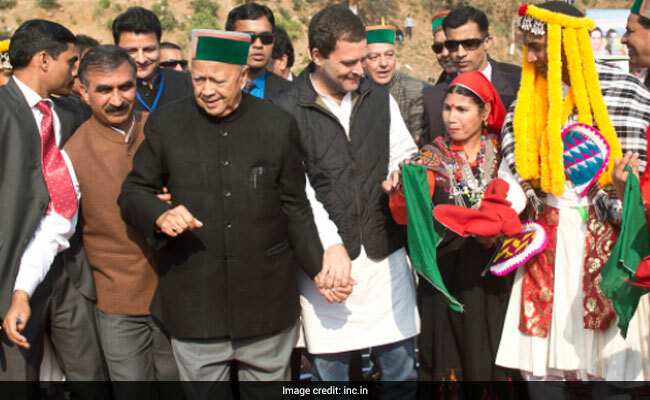 Himachal Pradesh, which has 68 assembly seats, votes in a single phase on November 9. Votes will be counted on December 18.